Joe Garner got his side out of jail with a last-gasp leveller after Wigan Athletic were almost embarrassed by rock-bottom Ipswich Town who played for 65 minutes with 10 men. The Tractor Boys recovered from the blow of Jonas Knudsen’s red card on 25 minutes - for pulling down Leon Clarke - to take the lead on 32 minutes. 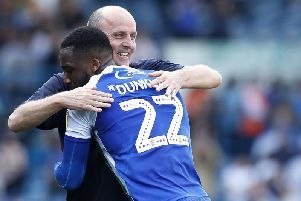 Chey Dunkley was adjudged to have fouled Collin Quaner in the box, and Will Keane - a former Latics loanee - beat Jamie Jones from 12 yards. Despite the second-half introduction of Nick Powell and Callum McManaman, Latics kept banging their collective heads against a brick wall. Clarke in particular missed three decent chances, with Josh Windass and Reece James also being denied. But as the game entered the first of six added minutes, Garner - on as an 81st-minute sub - popped up at the far post to turn in James’ inviting delivery. Latics remain five points clear of the drop zone with 13 matches to play, but they know they’ll have to play a whole lot better than this to keep their heads above water..
Town, despite having been cut adrift at the bottom of the table, were looking to complete a league ‘double’ over Latics, having beaten them 1-0 at Portman Road in December. And they started by far the brighter, with Keane seeing an early snap-shot helped round the post by Jones. The resulting corner was flicked on by Matthew Pennington and Keane was very nearly able to turn it in at the far post. With Latics struggling to gain a foothold in the game, they were given a lifeline on 25 minutes when Clarke stole a march on Knudsen, who elected to pull down his man. Referee Lee Probert had the red card out in a flash, and the visitors were forced into an unscheduled reshuffle. Latics couldn’t take immediate advantage, with Kal Naismith’s free-kick finding only the wall, and Windass seeing another effort deflected over. There seemed little danger as Quaner entered the Wigan box, but he went to ground after minimal contact from Dunkley, and Keane made no mistake with the spot-kick. Wigan’s attempts at a response were disappointing, with Windass heading a James cross way over the bar, and Anthony Pilkington nodding wide from a Naismith delivery. And they were indebted to Jones at the other end for tipping over a speculative strike from Alan Judge as half-time approached. Latics were finding their feet at long last, and lovely work from Windass down the right saw him find Clarke, who could only flick the ball wide of the target. Clarke had another chance shortly after after great stuff down the left by Michael Jacobs, but again he was unable to work the goalkeeper. Paul Cook rolled the dice on the hour mark by withdrawing Dunkley and Pilkington, and sending on fans’ favourites Powell and McManaman, with skipper Sam Morsy dropping back to the heart of the defence. But still it wasn’t quite happening, as a James free-kick beat the Ipswich wall but not their goalkeeper, before Naismith fired aimlessly over the tp. That was the signal for Latics to go all-in, with Garner taking over from Windass to support Clarke up top. Powell saw a header, from a James cross, well saved by Bartosz Bialkowski, but the Town goalkeeper was unable to prevent Garner levelling the scores on the 90-minute mark. James laid it on a plate with a fabulous cross from the right, and Garner tapped home to rescue a point for the out-of-sorts Tics. It was harsh on an Ipswich side who had defended for their lives, and they only avoided salt being added to the wounds in the dying seconds when Bialkowski clawed away a decent Jacobs effort from distance.